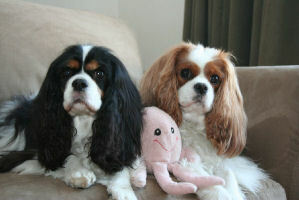 --Never buy a Cavalier King Charles Spaniel from a pet store. Buy a Cavalier only from its breeder, and communicate only with that breeder. --Be skeptical of breeders* who offer several breeds in addition to Cavaliers. The more breeds a breeder offers for sale, the more likely that breeder is a puppy miller or a broker. --Be skeptical of breeders who claim to offer health guarantees, or even "very strong health guarantees" or the like. Insist on getting copies of these guarantees before you pay any money to these breeders. --Be skeptical of breeders who claim that they are "reputable" or "responsible" or "ethical" or the like. Anybody can say that. Those are terms that only other people should use to describe the breeders, and should not be used by the breeders themselves. --NEVER buy from someone who offers IRISH IMPORTS! They will claim that they are breeders or relatives of breeders. The reality is that they import puppies from Irish puppy farms and offer them for sale in the U.S. Remember: buy a Cavalier King Charles Spaniel only from its breeder, and communicate only with that breeder. --Do not buy from breeders who have no health information on their websites. Be particularly careful if the breeder tries to downplay the significance of Cavaliers' serious health problems, like heart disease. --Avoid breeders who don't know the name of the breed. There are breeders, particularly on the Internet, who call the dogs such names as "King Charles Cavaliers" or "Cavalier King Charles Terriers" or "King Saint Charles Cavalier Spaniels". If the breeder does not know the breed's name, back away and move on quickly. 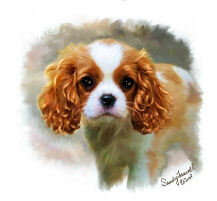 --Avoid breeders who say they breed only "small", "tiny", or "teacup" Cavaliers. Breeders who intentionally try to breed Cavalier King Charles Spaniels only in the 10 to 12 pound range cannot have the best interest of the breed in mind. The breed standard's range of weight is from 12 to 18 lbs, and many males tend to weigh more than 18 lbs. --Do not buy from breeders who have not registered their dogs with the CKCSC, USA, or the AKC -- preferably both registries. If the breeder does not care enough about the breed to have the litter parents registered with either the CKCSC, USA or the AKC, then the breeder cannot be serious about improving the conformation and temperament of the breed. --Avoid breeders who register with such "registries" as the ACA (American Canine Association) or APRI (America's Pet Registry, Inc.) or CKC (Continental Kennel Club) or the NKC (National Kennel Club). There are many others too. --Do not buy from breeders who will not let you see the puppy's mother and/or father or the kennel facilities. Whatever it is that the breeder does not want you to see probably is exactly what you ought to see . . . When shopping for a home, it's about location, location, location. When shopping for a pup, it's about breeder, breeder, breeder (not the breed)! *In these referrals to 'Breeders', please understand the term is being used very loosely on this site. It is hard for a reputable breeder, who is doing all they can to improve the health, quality and temperament of their beloved breed, to refer to puppy millers or brokers as 'breeders'.